Yuck. 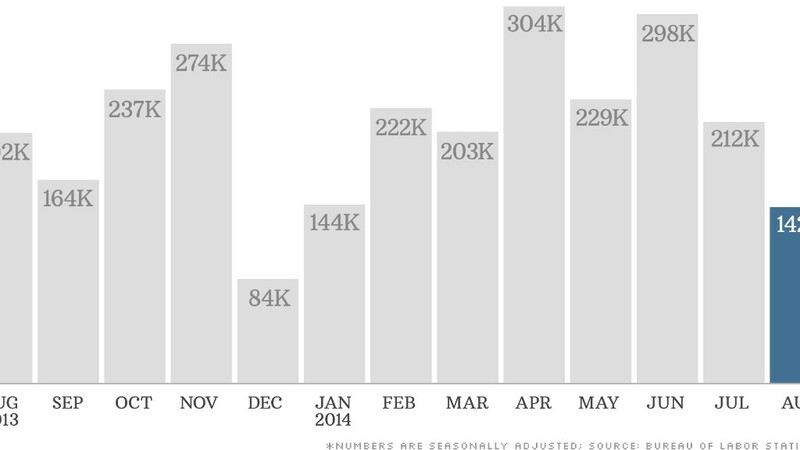 The jobs market lost some steam in August, with only 142,000 jobs added last month. The consensus forecast from economists surveyed by CNNMoney was for a jobs gain of 226,000 jobs. The unemployment rate dipped slightly to 6.1%, down from 6.2% in July. That was in line with estimates, but it wasn't much for job seekers to celebrate. This breaks a streak of six straight months with more than 200,000 jobs added. It may raise questions about the strength of the job market's rebound. Many Americans already do not feel that the job market has fully recovered from the Great Recession. Federal Reserve chair Janet Yellen has also repeatedly stressed that the labor market could be stronger. Friday's numbers are unlikely to change the Fed's decision to keep a key short-term rate at historic lows for the foreseeable future in an effort to stimulate more job growth. That appears to be what Wall Street is counting on -- stocks were relatively flat Friday. The yield on the 10-year U.S. Treasury dipped as well, a sign that the bond market does not believe the Fed is going to make any big moves just yet. "Yellen is looking at trends. The Fed is not going to be terribly reactive to one month of data," said Chris Molumphy, chief investment officer of Franklin Templeton Fixed Income Group. He added that there would need to be at least two more months of subpar jobs growth before the Fed -- and consumers and investors -- should be worried about the economy. But it's not all bad news. The economy has averaged nearly 220,000 jobs added a month, and the payroll gains were revised higher for both June and July. One expert said that it's important to remember that the August number could eventually change as well -- for the better. "This number will be revised higher. August is the quirkiest month," said Phil Orlando, chief equity strategist with Federated Investors. "This is inconsistent with strength we're seeing elsewhere in the economy." Recall that the government originally reported that zero (that's right, zilch) new jobs were added in August 2011. The number wound up getting revised sharply higher a couple of months later. Beyond the headlines: Hourly wages rose slightly. They are up 2.1% over the past 12 months. However, that's only slightly higher than the inflation rate. So workers won't feel much better off. There were solid job gains in several industries that tend to pay well, such as business and professional services and health care. Jobs were added in the construction sector as well, a possible sign that the housing market is continuing to bounce back. 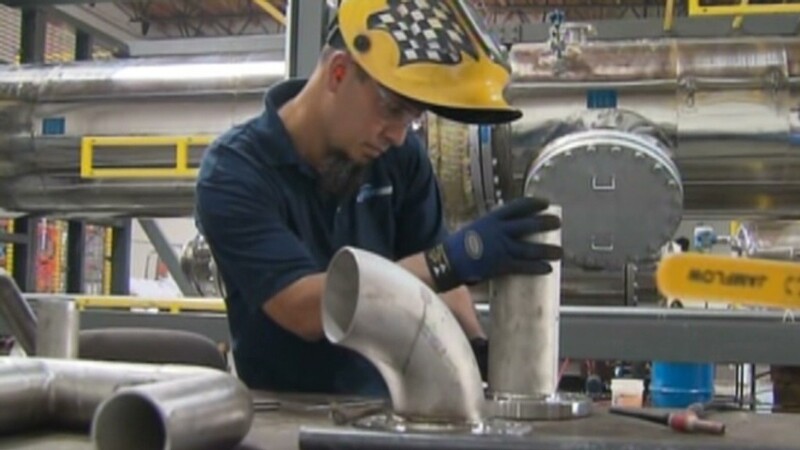 John Canally, chief economic strategist for LPL Financial, noted that weakness in the manufacturing and retail sectors, dragged down overall job growth. He said there may be some strange seasonal, end-of-summer factors to explain that. "My view of the job market is unchanged from where it was before this report came out. This is an anomaly," Canally said. Still, there were other lackluster signs in the job report. The so-called "underemployment rate," which counts discouraged workers who have given up looking for jobs and people working part-time who would rather have a full-time job, is 12%. That's down from July but still nearly double the official unemployment rate. And the labor force participation rate, which measures how many people of working age are actually in the job market, remained near its lowest levels in more than 35 years. That's a function of more and more people, particularly women and retiring baby boomers, dropping out of the work force. The political reaction: U.S. Secretary of Labor Thomas Perez noted in a statement Friday morning that the private sector has now added jobs for 54 consecutive months. That's the longest streak ever. But he added that "there are still 3 million long-term unemployed Americans, and we can do more to help those who are still struggling to recover." He reiterated President Obama's call to Congress to raise the minimum wage. House Speaker John Boehner did not address the minimum wage issue in his own statement. But he said Republicans in the House have "advanced solutions to help create more jobs, lower costs at home, and restore opportunity for all Americans," but that the GOP's plans "have run up against a brick wall" in the Democrat-controlled Senate.